ABSTRACT: Indurated calcareous rocks often offer opportunities to date and examine local palaeoenvironmental conditions from the analysis of included microfossils. While most microfossils provide valuable biostratigraphic information through thin section analysis alone, diagnostic and palaeoenvironmental information typically require free specimen observations. 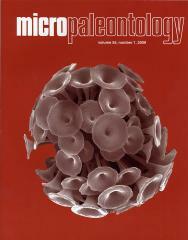 A range of extraction techniques are well documented for the commonly encountered robust microfossils (foraminiferas, ostracodsâ€¦), but a method is still missing for the delicate calcareous groups. This paper presents a method for extracting calpionellids from highly indurated calcareous rocks. This method is based on the use of chlorhexidine and benzalkonium chloride. These compounds form complexes with the matrix of calcareous material and render it soluble. The technique is easy, quick, economical, and produces reliable results. Importantly, for the first time it allows the observation of the delicate external morphology of calpionellid specimens using a scanning electron microscope (SEM). This may prove to be helpful in better defining the taxonomic position of this group of organisms and might also be useful in determining their palaeoecological affinities. This technique might also prove applicable for other delicate groups.